The question at hand is: given a node in a finite DAG, what are all the possible traversals of edges through the graph starting from that node? We know that any traversal of a finite DAG must eventually terminate in a node that has no outgoing edge, and that there are finitely many such traversals. Let’s reason recursively. What is the base case? If we are in a room with no outgoing passages, then there is exactly one path we can go on, and that’s the empty path. That was easy, as the base case should be. What’s the recursive case? If we know all the traversals of all the nodes that are reachable immediately from this one, then we can simply add the edges that get us to each of them to the traversals. // The key is the edge, the value is the node. And sure enough, those are all the possible ways to get from the Troll Room to the Maintenance Room in this DAG version of the map. Solving the “find all traversals on a cyclic graph that do not go into cycles” is a slightly trickier problem but perhaps you can see how to modify the algorithm to do so. At that point you could put the rest of the edges from the original map into the graph and see how many ways there are to leave the Troll Room and run around the Great Underground Empire without crossing your own path. Next time: We could make this algorithm slightly more general, and in doing so, discover a surprising result. Very interesting, but isn’t this tailored towards DAGs with just one “dead end”? The idea is pretty much the same, except that all intermediate paths are also generated (to allow for any “finish” node) and I sticked to iterator blocks instead of using a stack. The algorithm I give finds all the traversals from a given node no matter how many “finish nodes” there are; the fact that there is only one will come in handy in a future episode. 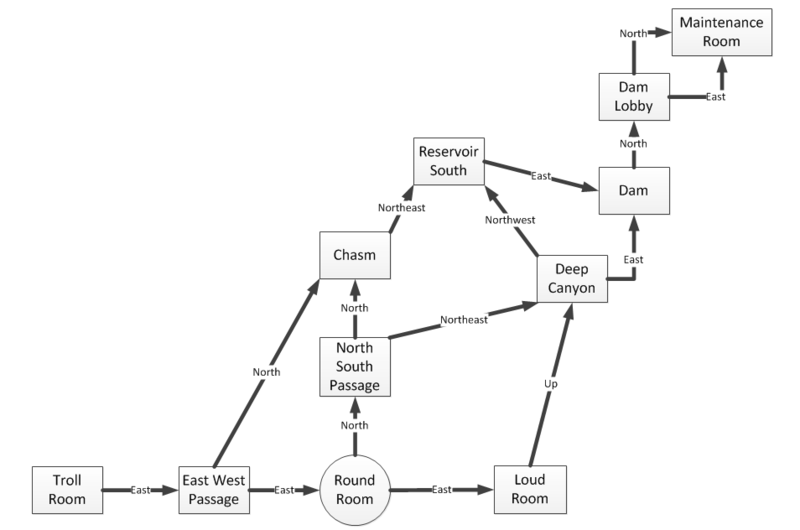 It is just a coincidence based on the structure of the graph that this also answers “What are the paths from Troll Room to Maintenance room”. …and if each edge has a “distance” or “duration” value associated with it, we can easily find the shortest and quickest paths, respectively. Indeed, though I already discussed that problem in my series on the A* algorithm a few years back. The system I’ve set up here does not easily allow the edge labels to be weights because they must be unique. Could edges be used as weights if duplicates were resolved by simply adding a small “adjustment” either when a collision was detected, or else preemptively (e.g. if weights will be positive integers less than one billion, and there will be no more than four billion nodes, give each node an `Int64` “weight” which is equal to the desired weight plus a node index)? That could be done, but sounds a bit clunky to me. I’d rather keep the edge labels as Eric has designed them, and add supplemental properties to the edges (such as “distance” and “speed limit”). It all really depends on the use-case, as Zork doesn’t require either. An index pair would work though I would prefer the pair “weight, guid” and now you can have as many edges between nodes as you want with whatever weights you want. But like I said in the previous episode, if I were trying to solve the problem of traversal of a weighted graph then I would choose a different data structure in the first place.